Why Are Some Medical Schools Still Killing Pigs to Train Students? Your surgeon knows the precise spot to cut into you. Your surgeon knows how much is the right amount of pressure to apply on the scalpel, and how to remove your organ without tearing neighboring vessels. It is likely that your surgeon perfected such techniques by cutting into living dogs or pigs that were subsequently euthanized. It is possible that your cardiologist has taken the same class in medical school, even though cardiologists do not perform surgery. Your doctor, who specializes in internal medicine and preventative care, may have also taken this course. Throughout the history of medical education, live animal laboratories were a mandatory class for most medical students. Yet the vast majority of medical fields do not involve surgical procedures. “I could have done without it,” said Barbara Wasserman, an internist who took a dog laboratory during her studies at Johns Hopkins School of Medicine in the ’60s. Beginning in the late ’80s, medical schools in North America have been gradually altering their curriculum to make live animal labs an optional course because it was not necessarily relevant for all students and it raised ethical concerns. As technology advanced, most schools today have completely replaced animal laboratories with technological innovations such as human simulators. Or at the very least, the medical schools that continue to teach with animal laboratories have replaced dogs with pigs. Out of the 188 accredited medical schools in North America, only the University of Tennessee Health Science Center and the prestigious Johns Hopkins continue to teach with live animal laboratories. The administrations from these two schools argue that the complete riddance of animal laboratories may compromise the quality of health care, while other medical professionals and animal rights activists believe that simulators serve as a superior teaching model because it more accurately reflects the human anatomy and it doesn’t involve the killing of animals. This has been a subject of contention in the medical field. John Pippin can still remember the anxiety he felt in 1976 when he saw the rows of deeply sedated dogs. Pippin is the director of Physicians Committee for Responsible Medicine (PCRM), a nonprofit organization of 12,000 physicians that advocates for alternatives to animal research. On Pippin’s first day at dog lab at the University of Massachusetts Medical School, he walked up to a brown and black mongrel that looked about 50 pounds. We didn’t see why we needed a dog to add to our education. It was probably someone’s pet at one point, Pippin remembered thinking, as he and three other students prepared to operate on it. There are medical professionals who, looking back, said such animal labs were a meaningful class. After all, it’s the first opportunity to cut into a live creature, the first opportunity to do incisions, remove organs, and sutcher. But Pippin remembered thinking the lab was unnecessary. They studied physiology in another class by putting IVs and catheters on each other. He knew they would also go on to get supervised clinical experience. “We didn’t see why we needed a dog to add to our education,” he said. Pippin and his classmates hooked the dog to the electrodes. Right before the surgery began, the dog’s heart beat started to slow. They stared at the monitor as the heart beat slowed, and then stopped. An instructor came over to inject more drugs into the dog, but it did not come back to life. Pippin surmised the dog had been given more anesthesia than its body could handle. Due to ethical concerns, students at the University of Massachusetts Medical School started a protest against animal laboratories in the late ’80s, which subsequently led the school becoming one of the first in the country to remove animal laboratories from its curriculum. Pippin, who went on to become a cardiologist, said it was an unnecessary class for him. The anatomy of dogs varies greatly from that of humans. The size, structure, and location of the heart is different. The way a dog’s body responds to heart attacks is different. When a dog loses circulation, it has the ability to open circulation in another area, whereas humans do not. From ultrasound visualization to electrical nerve stimulation, many different kinds of technology have entered medical classrooms. But human simulators are the main technology that replaced the use of animals in medical schools. A simulator, which looks like a mannequin, can have amputated limbs, open chest wounds, and a fake heart that squirts blood if a wrong vessel is cut. Some simulators can produce realistic gore and mimic human skin. After trainings, schools order replacement parts such as new torsos, and replicas of wounds and boils. There are certain surgeries where only simulators will work for practice, such as heart and lung disease. Simulators can mimic human neurological responses during emergencies such as a cardiac arrest. We’ve been told by some it can be very traumatic if the students can’t save the mannequins. The simulator can show changes on the electrocardiogram (an electrical picture of the heart that is acquired by placing electrodes on one’s body). When a simulator overdoses on opium, students see that its heart rate slows and the blood pressure goes down, and its respiration becomes deeper. If a student makes a mistake the simulator can “die.” The situation can be so intense that students sometimes cry in class. The Medical College of Wisconsin (MCW) fully replaced its animal laboratories with technology in 2010, although it was reluctant for many years. For years MCW students had expressed concerns about animal laboratory usage. In February 2008, 100 people attended a PCRM-led protest against animal laboratories outside MCW. 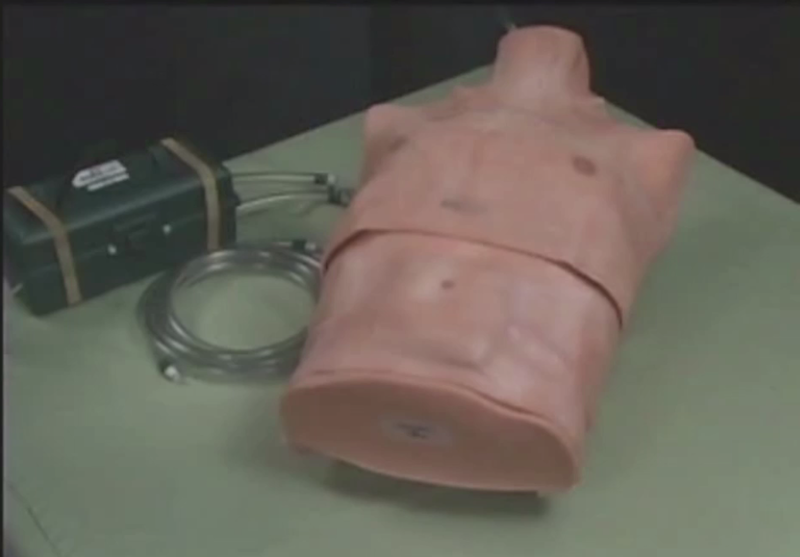 A screen shot of a human simulator torso from a video on www.simulab.com, which is a company that sells medical simulators. As an attempt to please animal rights activists, modern animal labs have replaced dogs with pigs. But animal rights activists argue that it doesn’t make the lab more humane. Students insert long, thin tubes with lighted cameras into pigs, who are killed after each training. But it may be necessary for some programs to keep such labs for the time being. Simulators can’t mimic everything, at least not yet. For some schools, depending on their specialties, the solution lies in combining technology with some pig labs. The American College of Surgeons, which is not a medical school but an educational association of surgeons, recently incorporated technology in its training and opted for less animal usage. A representative from the American College of Surgeons said the expensive transition is worth it albeit they cannot yet go completely without animals. Simulators lack some of the reality of tissue handling and the tissue characteristics of the different organs. 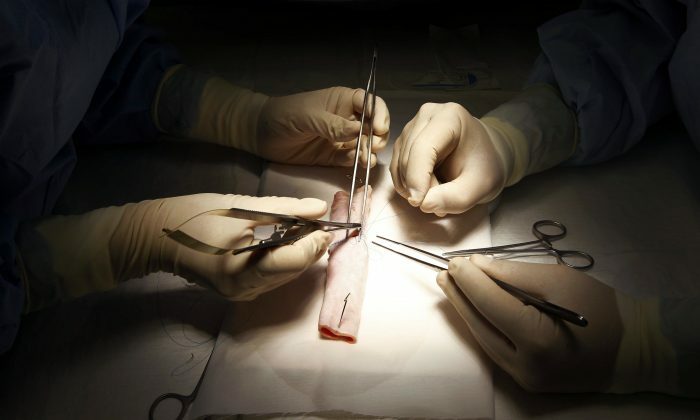 “Simulators obviously provide a great alternative as they are available 24/7, they can be programmed with a curriculum in mind, they store data regarding the procedure, and they can provide immediate feedback to the person practicing, which is essential to learning,” Dr. Carlos Pellegrini, a past-president of the American College of Surgeons, wrote in an email. A cardiologist like Pippin may feel that receiving supervised clinical experience during the latter part of his medical education is sufficient but that may not hold true for all medical professionals, such as surgeons. The University of Tennessee Health Science Center, one of the two schools that continues to teach with animal laboratories, also uses a combination of technology and animals for this reason. Live animals give them a sense of personal responsibility and accountability for life … to a degree that no other experience in medical school provides. Champlin added that the university is looking into alternatives on an ongoing basis. Johns Hopkins, which has reduced the use of animals in its medical school curriculum by more than 60 percent since 2010, is holding on to the vestiges of its program for similar reasons. “Live animals give them a sense of personal responsibility and accountability for life, and therefore an appreciation for the sanctity of life, to a degree that no other experience in medical school provides,” Audrey Huang, director of media for the school, wrote in an email. Huang said Johns Hopkins regularly reviews its animal lab program with bioethics faculty, educators, and current and former medical students, and cuts any unnecessary use of animals. Simulators still can’t replicate reactions such as the inflation of a collapsed lung, nor the muscle contraction caused by electrical nerve stimulation. What does that mean for the quality of our doctors since most medical schools have completely removed the program? No comprehensive study has been done on this since there are many factors to consider and medical curricula are constantly evolving. One thing to keep in mind is that regardless if medical students have taken animal laboratories or not, they still need to pass three comprehensive paper exams and one clinical skill test before they can work as professionals. A new “synthetic skin” developed by researchers at the University of Guelph could radically change how drug testing is conducted by pharmaceutical companies and universities. People hunt for many reasons—it’s not just for trophies.